On paper, Friday’s Flagler Beach City Commission meeting appeared to be routine. But then, so did Monday’s Bunnell City Commission meeting agenda. Neither was. There were no scabrous revelations or attempted firings at the Flagler Beach meeting, but it began with a no-less flammable proposition that commissioners quickly snuffed out: That the city could save money by merging its beleaguered fire department with the county’s. The Flagler Beach Fire Department has been reeling from a scandal that led to the hurried firings of its chief and four other members of the department over alcohol and code of conduct issues. Resident Rick Belhumeur lit the fire as he kicked off the public comment segment at the start of the meeting. Belhumeur, recalling how City Manager Bruce Campbell had invited residents to submit their cost-saving ideas in previous budget sessions, maintained the city would save $250,000 a year by merging fire-emergency medical services under the county umbrella. Commissioner Kim Carney had wanted to have the matter discussed openly. She’d placed it on the agenda. Bruce Campbell, the manager, pulled it, according to the assistant city clerk. It’s unusual. But it’s not outside Campbell’s authority: the city charter gives the city manager, not the commissioners, the authority to decide what is and what isn’t on any given agenda, specifying that he compiles it, and he “shall have the liberty to schedule agenda applications as necessary due to meeting length.” Still, if length was an issue on Thursday, it shouldn’t have been: the commission’s agenda was among its shortest, and the meeting clocked in just past two hours, remarkably brief for this commission. It could have easily accommodated a discussion on the fire department, especially in light of its own very loud silence since the scandals. That was the context of Belhumeur’s ire. That, and the fact that barely 24 hours earlier, during a budget workshop of its own, the Flagler County Commission itself broached the subject of fire department consolidation–what had, until then, been a sort of third rail of commission discussions. It was Commissioner Charlie Ericksen who touched the rail, only to be electrocuted by several commissioners’ responses. He made clear, as Carney also did Thursday, that he would not be backing down in future discussions. “The county already has two full-time firefighter-paramedics assigned to Flagler Beach,” Belhumeur said at the Flagler Beach meeting. “These county firefighters respond side-by-side with Flagler Beach firefighters.” Palm Coast’s fire department also routinely responds to fires in Flagler Beach, and at times the Bunnell Volunteer Fire Department joins in. 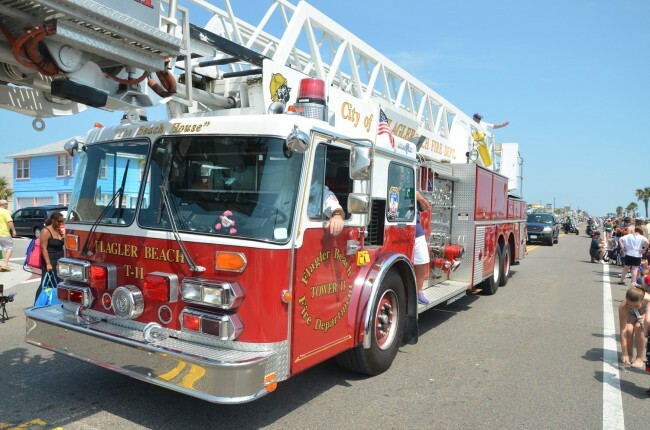 At least 95 percent of calls to the city Fire Department are for emergency medical service, Belhumeur said, a percentage typical of every fire department. “When there is a fire,” Belhumeur said, not entirely accurately, command of the scene is shifted to the Flagler County Fire Department. It sometimes is, as was the case when a wildfire threatened (and damaged) homes in Beverly Beach in March. But command also remains in Flagler Beach’s hands, as it did even the night of the fire that triggered the scandal in December. “Why then is the city paying big bucks for a fire chief and assistant fire chief?” Belhumeur said. Belhumeur accused the City Commission of “playing politics like Washington politicians” by not putting the future control of fire-emergency medical service on the agenda. Belhumeur urged the City Commission to ask Flagler County officials for an updated proposal to take over the city’s fire and emergency medical needs and discuss it at the next meeting. Although the City Commission normally refrains from commenting on discussion from citizens on items not on the agenda, Chairman Steve Settle opened the door to responses and comments from himself and other City Commission members. Settle said the comments from residents he hears do not support turning over fire and emergency medical services to Flagler County, but rather favor an effort to heal the city Fire Department shattered by the firing of five firefighters, including the chief, after an investigation showed personnel responding to a fire after drinking alcohol at a holiday party, as well as storing alcohol at the Fire Department. Chief Martin Roberts was fired in February along with paid firefighters Jacob Bissonnette and Shane S. Wood, along with volunteer firefighters Steven W. Wood and Barbara Haspiel. A sixth firefighter, Bobby Pace, was suspended three days without pay after falsifying the hours worked by a person assigned to perform community service by the court. The state attorney is looking into whether criminal charges are appropriate in Pace’s case. Settle invited everyone in the city to attend an open house at the Fire Department on May 6. He said people would be pleased with progress that has been made. “I’m not trying to beat up on the fire department. That’s a lot of money,” Belhumeur said. Joy McGrew, city commissioner, said her perception of public opinion coincides with Settle’s. “Any time and every time there’s been a suggestion of farming out the Fire Department, it has been overwhelmingly, do not get rid of our fire department, or our police department, and that has been citywide,” she said. But Carney staked out an opposite view. “That’s pretty clear. Thanks,” Settle said. Campbell didn’t say a word throughout the discussion, nor did he explain why he’d pulled the item from the agenda. He did not return several calls to his office and cell phone on Friday. Commissioner Marshall Shupe, who is also a volunteer firefighter intimately connected with the department–and far from a disinterested voice in the matter–saved his comments and his emotions for the end of the meeting. 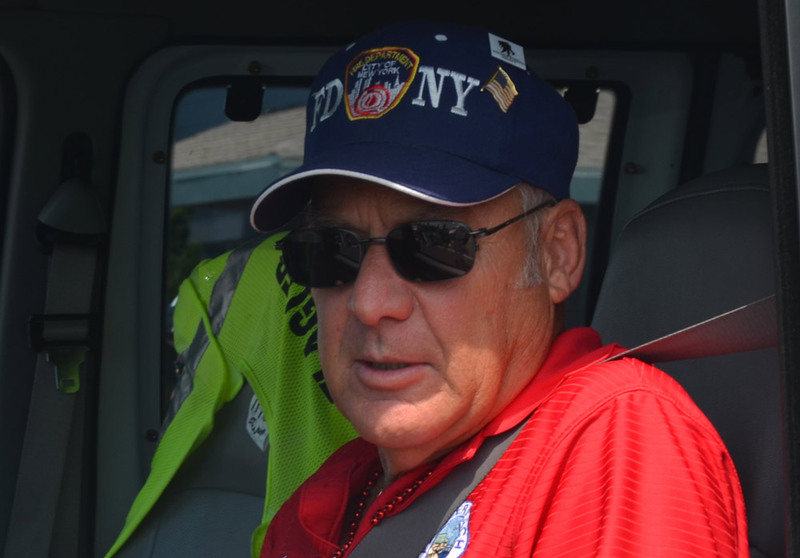 He defended the city Fire Department, urged people to attend the open house to see improvements and asserted that volunteers give the city swifter emergency medical response. There would be no volunteers under the county, he said. That was not a correct statement, however: Flagler County Fire Rescue has 30 volunteers currently (judging by the number of volunteers for whom it pays workers’ compensation insurance), and they could presumably be deployed under the county’s authority just as well. There was another inaccuracies in Shupe’s statement, as when he described an instance when, four days earlier, the county’s ambulance that’s normally stationed at the Flagler Beach station went to Palm Coast for coverage, because the units there were overtaxed with calls, suggesting that the city would then be underserved if the county alone were in charge. But, aside from the fact that ambulance units are routinely shuffled around the county to ensure broad coverage–an issue the cities have no control over whether they have their own fire departments or not– volunteers can’t provide what Advanced Life Support the county’s paramedics do provide, while Shupe’s example only underscored the fact that even now, a county ambulance is permanently stationed in Flagler Beach. A response from similar county certified personnel would take longer, he said, though the county’s ocean-rescue certified unit is stationed in the Hammock, just north of Flagler Beach. Shupe barely controlled his anger as he launched into his criticism of talk of consolidation. It only makes sense at this point. The city is being double taxed for a sub-par service, while being led by an inexperienced Acting Chief, with rookie firefighters below him. Enough with the rompa room, get the professionals in there to do the job. The members there aren’t “ocean certified”, they do an annual swim to the end of the pier and back. Oh, and yes, the Acting Chief is facing possible felony charges. You want to put trust back the citizens about the fire department? Start with a trustworthy Chief! I will believe it when I see it Charlie Ericksen—you shouldn’t have taken it this time. Why wait till next time? You’ve been around long enough to know how it is, and yet you just sit there and take it. I could never understand why fireman and fire departments seem always to be involved in some controversy. It would seem obvious that Flagler Beach cannot continue to rely on volunteers in this day and age. They can’t afford the medical and pension costs to support a fire department, I think they should merge with the county. Stop all the politics and do whats right. And please let’s not forget the that the beaches fire department can only treat BLS(basic life support) calls so when your family member is having a heart attack they can hold your hand while you wait for the next closest county paramedic available to come save their life!!! Wake up people it is the county who already provides the medical help we need, why not have them on our engines too so they can do more then just hold hands, take blood pressure and bandage up a cut. If the county’s paramedics who are stationed along side our guys at the beach, have to transport a patient to Jacksonville, then when there is a medical emergency we have to wait for help to come from the airport or the hammock!! I want the medical services as well as the fire services that I deserve!!! And it would seem that there are more medical emergencies then fire emergencies on a daily basis. So if merging will get me better and more reliable medical services then I am all for it!! And if it will help the budget also, then bonus!! But this shouldn’t be about money, it should be about our safety!! And waiting 10+minutes in a medical emergency because the paramedics at the beach are on a transport is unacceptable to me. It sounds to me as if more voices need to attend these County Commission meetings. Bad decisions are made in the absence of voter interest. Change that and you’ll have better government. Let’s face it… the Flagler beach Fire Department has issues. Even now, the acting Chief is facing possible criminal charges related to his involvement with the Fire Department. This Fire Department needs to be upgraded to the 21st century and the City can’t afford to do that. Consolidating departments with the County would provide every resident of Flagler Beach with a better level of service and save the City enough money to affect every Flagler Beach resident’s tax bill. The City could probably afford to do what they need to do…. oh, wait… they just bought a New Golf Course!!! i agree tax payer marshall should step down .when ed kuhnlien was a commissioner he left the dept for the time he served and restrained from fd business..the firestation is marshalls little playhouse he feels important up there does he have little mans syndrome?its time for the county to take over and give the residents what they deserve. Well said Tax payer!!! I couldn’t agree more!!! Let’s be honest. All fire departments have issues, no matter where you are. The bottom line here is money. If it will save money, and I want to see the real savings, then consolidation is the way to go. It is that simple. No emotions. Time for the citizens to get their heads out of the sand and demand that Flagler County Fire Rescue take control of the Flagler Beach Fire Department. It is a win, win for all concern. I remember years ago when Flagler Beach transfered the police departments dispatcher position to the county. Many of the Flagler Beach pundents went crazy over this and claimed all kind of bad things would happen to the quality of police service. I did not happen. Maybe it is also time to look at transfering the police responsibilities to the county also. Think about the tax savings you could have. Bruce Campbell needs to go now! I say that at the next meeting, someone make the motion to fire this incompetent fool! If you cannot take control of your fire department, then let the county do it! They will staff an additional 2 or 3 Firefighter / Paramedics at the station on a 24 / 48 schedule which will ensure the city is fully covered at all times! These Firefighter / Paramedics can do a whole lot more on a scene than can a Volunteer Firefighter who is most usually certified as only a First Responder. They can administer the critical Advanced Life Support treatment that is often crucial to the survival of the patient prior to arriving at the hospital. Granted, FCFR already operates Rescue 11 out of Flagler Beach, which is manned by 2 Firefighter / Paramedics; however they are normally called for medical calls in other parts of the county, and even an occasional medical transport to Ormond Beach, Orlando, St Augustine, Jacksonville, or even all the way to Gainesville! The City Commissioners of Flagler Beach need to open their eyes for just a moment, swallow their pride for their own city fire department, and realize what is more important. Would you rather have a fire department run amuck with volunteers working multiple jobs and with minimal training, and all the corruption and blatant stupidity as of late? Or, would you rather have a fire station that is run professionally by highly trained and certified Firefighter / Paramedics that can perform their duties with much more efficiency? As for Commissioner Schupe’s comment as to Flagler County Fire Rescue not having volunteer firefighters, Station 31 in Korona, Station 51 in Espanola, and Station 81 in Deep Creek are fully operated by Volunteer Firefighters! This volunteer roster numbers close to 30, and most of them are certified Firefighter I / II as well as certified Emergency Medical Technicians (EMT). With all of the apparatus and equipment housed in Station 11, I am sure the county would not terminate the volunteer program in Flagler Beach. In my opinion, they would only enhance their training and put an end to the in-fighting that has been going on in that place for over a decade! Let the County Fire Rescue take control of that place! Not only will save a few hundred thousand dollars a year that you can coffer into your pay raises that you vote for……but you will enhance the safety and security of the residents of Flagler Beach!! Maybe for once, you could all find it in yourselves and do what is right for the people, and not what is right for your political careers! Mr. Shupe, you say “theres alot of things people dont see”, unfortunatley i believe your problem is people are begining to see what the logical and safest choice for your city protection is!! You mentioned the work those guys have been doing for the past 4 months, they have been, no one can take that away but that is an irrelevant point when discussing the county taking over. You also mentioned the water rescue response from the station in the hammock and it taking longer, if the county took over the only sensible thing to do would be to ALSO staff station 11 w/ certified water rescue personell and equipment. My confusion enlies here, if you can get a better service for the same amount or less money why would you not take it? This defies all logic that you or any one else has ever been taught!! No one is bashing your department or the dedicated employees you have keeping it together over there but youre not providing the “BEST” service possible. You have a couple of paramedics working for your department that are unable to function to their fullest potential due to you being a BLS(basic life support) dept. Are you that dedicated to your department that you will willingly put you and your family at risk to recieve sub par medical attention if the rescue stationed there was out of the city and all you had coming to you was your fire truck w/ all things considered no medical equipment?!?! And if you are, what about all the citizens that you are making choices for being a commisioner? Think if they all truly understood what this is about they would agree or disagree with you? Again, theres only 1 logical answer!!!! Maybe its time to step back and reevaluate our thought process here! I agree that Campbell needs to go and a chief with integrity and experience needs to replace Pace. Then all the little pre-schoolers need to be separated from that place! I fail to see how turning the fire department over to the county is going to result in a cost savings to the residents of Flagler Beach. The county would have to hire 9 additional firefighter/paramedics to staff a fire truck in Flagler Beach. Also, there would be additional equipment and a facility to maintain. I’m sure the county would expect the city to pay for a majority of these expenses. This comes at a time when the county is struggling to provide adequate fire protection for residents on the west side of the county. (1) Fire Chief= $70,779 (1) Assistant Chief=$47,611 Basic Life Support Compliance& Maintenance=$14,125 Communications=$5,400 … It adds up fast and the list goes on. Keep in mind that every Flagler Beach Taxpayer is already paying the County and the City for fire protection. Someone that lives outside the city in the unincorporated county, such as someone in the Hammock area, has a better rated County Fire Department and doesn’t have to pay twice for it. Methinks some enormous egos are reigning supreme at Flagler Beach city hall and the citizens will pay the price for those shenanigans. Just Wanted to ask the Folks Who Follow this Site,(Flagler Live) which my Wife and I Do and Appreciate The Great Coverage of Our County!! We have lived Here for Over 38 Years. The Quaint Little Town of Flagler Beach that We have come to Spend Our weekends at Has Become Something of a “SPECTICLE” for Sore Eye’s !!! While the City’s Alleged “LEADERS” are Busy Bee’s Cleaning House, Take a Look around the City! When we come over for Our Friday Farmers Market Visit, its a Free for All just Trying to get a parking Spot. There are People Parked in the Road, Going up the Wrong way on One way streets Since the New South Florida Look has been Added its Absolute Chaos!!! Going to the Beach is Also getting “SCARY”!!!! We Used to go have Breakfast at the Pier and Take the Kids right down the Nearest Beach Walk. Not Anymore, There are Numerous People Hanging all along those Walkways, Intoxicated, Asking us for Money and cigarettes,! We have Never Seen so much Trash, such as Beer cans, Baby Diapers,Food Bags Etc. Everywhere!!! Not To Mention the Kids and Adults Bussing By on the Walkway, On Skateboards and Bikes, that Clearly States No Skateboards or Bikes ALLOWED! How about the “NO ANIMALS” ALLOWED signs Posted at Veterans Park and The Wickline Park?? ?, We Love Animals, Have two Dogs, But any Given Day You can Watch People Walking their Dogs, With Some Peeing or Poopin at the Base of that Very Same Sign !!! Another Issue we have and are Not Sure Who to Address it to is The Local Bars that We See Having Numerous Kitchen Equipt. Being Cleaned with detergents and Pressure Washers and its All Just Running Down the Side of the road into the Ground ??????? This is being Done on any Given Weekday, We are Sure someone Else has seen this Too! Our Point is We just think Someone Needs to Step Back, Take a Look around this Town and get a Grip on Whats Going On Here! !We Hope You Keep The Fire Dept and Police Dept, Lord Knows the County has Enough of its Own Problems, without having to Solve Ours!! One More Question we Would love someone to Answer, With All the Rift Raft around the Pier, What is The “FUNCTION” of the we guess “GUARD” at the Entrance to the Pier, Because if he is Paid by the City, That’s One JOB to Be ELIMINATED, He Does Nothing, Bring back the Kids Who we Used to see picking up all the Loose Trash Every Morning!!! Next Time Any of You are driving around Town just take a Look around on the Ground, On the Bridge, and Around the Boardwalk area across from the New 711! Hint to City, Hire a Beach Patrol Ofc. Its Just Gonna Get Worse Summers Coming! FLA NATIVE, You Hit the Nail on The Head !!! Will Mrs. Alice Baker Please Return !!!!!!!!!!!!!!!!!!! Funny thing about this whole situation is, how informed is everyone as to what they are paying taxes for? Do they truly know that they pay their city taxes as well as a county tax for fire services? Do they know that as the Flagler Beach fire dept stands now, they can do nothing to intervene if you are having a heart attack, literally NOTHING! Until of course you go into cardiac arrest, then they have a few BLS (basic life support) interventions to provide. Where as if the county took over and staffed an engine there you have ALS (advanced life support) protection, someone who can put you on a monitor and see whats going on with your heart and then give you medication to prevent further harm and possible death!! And this is just the tip of the ice berg so to speak! Fact is, if anything of significance medically is going on with you, the Flagler Beach fire dept can do nothing for you besides attempt to comfort you and wait on the county. Flagler Beach doesnt exactly have the youngest population over there, youd think theyd want the best medical protection out there and as it stands now, are no where near it! Stop by any fire station and ask about the medical protection and the differences…. Flagler Beach Fire Dept- BLS- means, basic life support- means they can sit there and watch while you die! Flagler County Fire Dept- ALS- means, advanced life support- means they can help stop life threatening injuries and illnesses! Should you need any other information? Are you serious Flagler Beach? I did stop by the station to ask about all this just to make sure the “county boys” (as ive heard them called) werent trying to blow smoke, they arent! This is real people, could be your life in danger tomorrow, I know who i want coming to help me!